Hothead Games is all about making the best games, and are one of the top 100 game developers in the world. They see instant apps as a powerful way to expand the top of their user acquisition funnel and expand their user base. 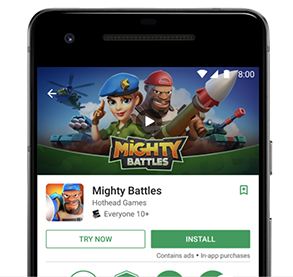 They built and launched an instant version of Mighty Battles, a real-time multiplayer battle arena game, which you can play by clicking the "Try Now" button on its Play Store listing. Hothead Games prompts players to install the full game after they complete the instant app's battle tutorial. Players also have the option to replay the tutorial. Since launching, click-throughs from the details page have more than doubled, with 15% of people clicking the "Try Now" button. Importantly, Hothead Games have observed no changes to install clicks, so the Mighty Battles "Try Now" experience is additive to their user acquisition funnel. Based on these results, Hothead Games is planning to bring instant app technology to more games. "The Mighty Battles instant app exceeded our performance expectations. We've almost doubled the overall click-through rate on the Mighty Battles Play Store listing, and new user acquisitions are up 19%+. We are planning to expand instant throughout our portfolio of games"